Honestly, I don't really want to write this review because I don't know what to say. So, I've decided I'm just going to word-vomit my stream of consciousness onto this site. Bear with me as I unravel my own thoughts in this review. Nyxia, book one, was something else. I was shook by how invested I became in the story, even though I'm not a huge sci-fi fan. Reintgen uses diversity, imaginative concepts, and incredible characters to drive an unpredictable story. Then, in book two, things take a bit of a turn. If you haven't read book one, stop reading this review now. The Genesis teens have reached the planet they're destined to alter forever, and obviously, the setting changes the feel of the book quite a bit. Suddenly there's no competition and no spaceship. I crossed my fingers and prayed that Reintgen would give us a Pandora-esque alien planet to explore, but in reality, he doesn't dive into this new setting as much as I hoped he would. I mean, it's an entire new world. How can you not spend time deeply developing it and using it as a platform for creativity? I was disappointed that we stuck more to politics and a few mentions of scary creatures. The characters still shine brightly. I loved watching Emmett and his crew bond as they face betrayal and danger, and I will ship Emmett and Morning for 83,451 years. Even when I got bored with the plot, I was still happy to read about the Genesis members. The ending left me with mixed feelings. 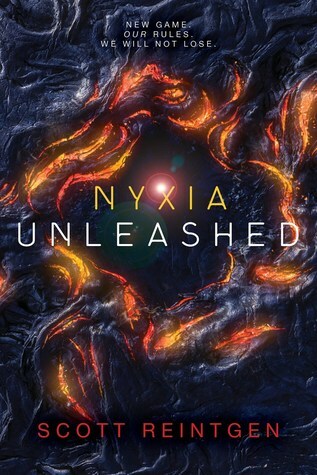 Part of me is desperate to know what happens next, but part of me also thinks book three will be even more different from the first book than Nyxia Unleashed. I guess I'll decide if I want to pick it up once it's released. Bottom line: This series is real good, but book two seems to be suffering from "middle book syndrome." You know, where the plot is desperately trying to find its way from point A to point B, but it's getting a little lost along the way? I'd recommend reading it if you LOVED book one, but if you felt kinda meh about this series already, it's probably not worth your time.